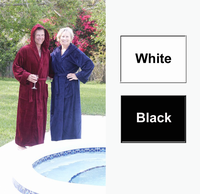 Enjoy this Terry Velour Hooded Robe in 54 inch length that comfortably fits Men from 150-190 lbs. or Ladies 135-180 lbs. (suggested over 5'7" tall) with a bottom sweep of 61.5 inches. Featured in this Soft, 100% Cotton Terry Velour Hooded Robe are two front patch pockets, tie belt, and a comfortable 12 oz. per sq. yard weight. It is soft like a stuffed animal on the outside and absorbs water like a thirsty towel on the inside. Imported. Color: Navy.